I'm a sucker for rituals. I love them. I love little rituals like the order in which I wash myself in the shower and I love grand rituals like the weird Christmas tradition we have of singing happy birthday to my grandfather who died in 2000. Rituals keep me pointed in the right direction while helping me to feel like I can explore places off the beaten path. Anyway, last night I was going to a masquerade party. I didn't have the means or the motivation to go all out but I wanted to look a little special. I don't remember what it was but something reminded me that I have a whole huge bunch of temporary tattoos. I sifted through them and found I couldn't choose between two of them because they felt perfect for the concept of holding/wearing/intending the things you want for the new year at the moment that year begins. This one is for my word of the year, FORWARD. 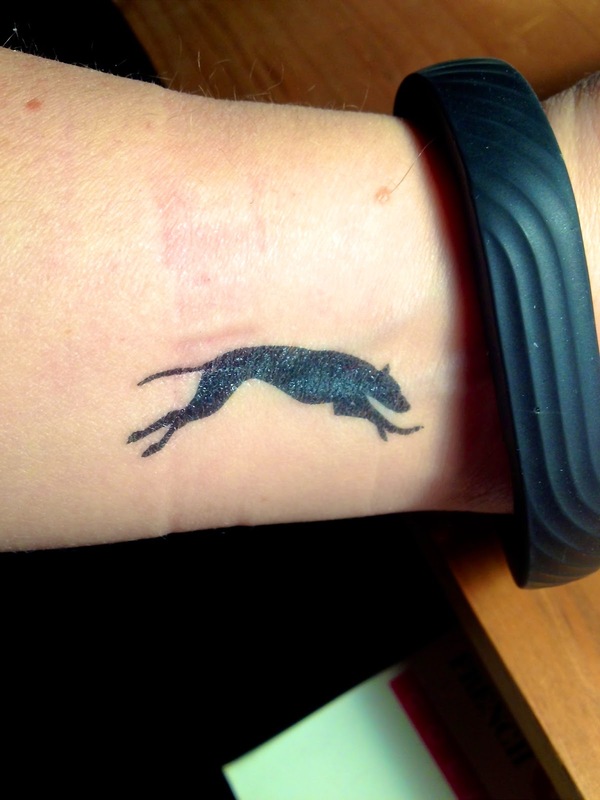 You would have laughed to see how long it took me to work out which arm to put it on because I wanted to be certain sure that the greyhound was pointing toward my fingers. That's where the words come out, you know. This one...I don't know if I'm ready to talk about it but I guess I am ready to show it so here it is. Or maybe the new year just makes me sentimental. One never knows. I love everything about this post. Rituals. Parties. Temporary Tats. Smitten. I can't wait to see what the year holds! Smitten. What a great word. Hopefully we'll get to hear the story behind the word one of these days.